Most children start out with big dreams of wanting a pony or to be an athlete. I wanted a CD player. It was the bane of my existence at the time. I had to pay for it myself without the help of GoFundMe or the power of a social media network. Mom wanted me to learn the value of a dollar. For a seven-year-old kid who did not earn a living doing chores and wanted everything now, $21 seemed to be far out of reach. Mom didn’t think so. She suggested I go back to the basics, start small. The “Dream Big, Start Small” mindset is central to the entrepreneurial spirit. It also happens to be the theme for this year’s National Small Business Week, a celebration held by the U.S. Small Business Administration (SBA) from May 1 to 7 recognizing entrepreneurs, business advocates and small businesses across the nation. 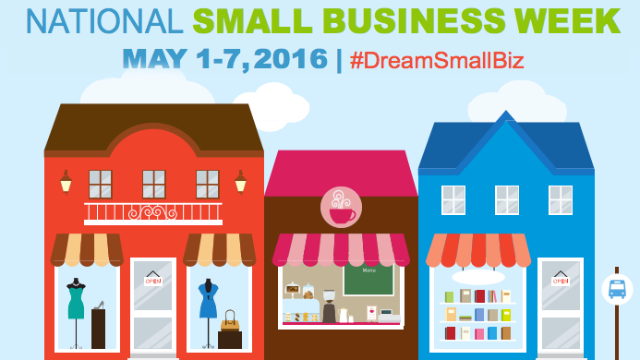 Every year since 1963, the president has issued a proclamation announcing National Small Business Week. A small business is defined as a business with less than 500 employees. 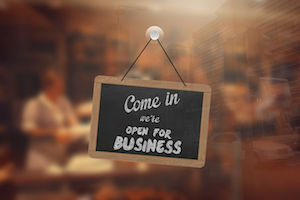 Small businesses are considered the backbone of the state and nation’s vibrant economy. According to the SBA, they are responsible for creating two out of every three new jobs each year and employ more than half of all Americans. In Florida, small business is big business. 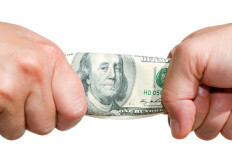 The state features a favorable tax climate with no individual income tax. 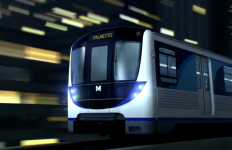 Its 20 million people present a major market opportunity. In fact, as the third most populous state, it boasts the fourth largest economy in the U.S. (19th largest in the world). A new report released by the Office of Advocacy, an independent office within the SBA, reveals 2.3 million small businesses call the Sunshine State home and employ 3.1 million people. The report illustrates the national and state-level economic growth, industry and jobs using data from the leading government statistical agencies. 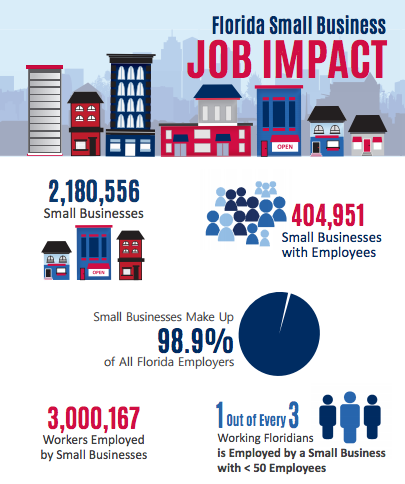 Source: 2015 State of Small Business Report: Small Business and its Impact on Florida. Small business represents 98.9 percent of all employers and accounts for nearly 43 percent of the state’s private-sector workforce. Firms with less than 100 employees have the largest share of small business employment. The industries with the most small business employment are health care and social assistance, accommodation and food services as well as professional, scientific and technical services. The number of minority-owned firms increased by 36.2 percent from 2007 to 2012. Of the 61,489 companies that exported goods from Florida in 2013, close to 95 percent were small firms. Small business owners and entrepreneurs are taking note of Florida’s entrepreneurial ecosystem. Several are recipients of this year’s SBA Small Business Week Awards, which honors high-quality small businesses and industry leaders at a district level that have significantly contributed to the state’s business growth, innovation and job creation. North Florida District Small Business Person of the Year is Sunil Tarneja, president of C.T. Windows, Inc. d/b/a Architectural Aluminum Techniques (Orlando). North Florida district and SBA State of Florida Small Business Exporter of the Year is awarded to a team this year. Co-winners, David Bello, Sr., president, and John Hartnett, vice president, global business development at Endoscopy Replacement Parts, Inc. (Newberry) will share the title for the 2016 year. 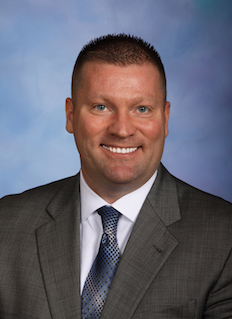 North Florida District and State of Florida Veteran-Owned Small Business Person of the Year is J. Peter Wilking, president of A1A Solar Contracting, Inc. (Jacksonville). North Florida District and State of Florida Woman-Owned Small Business Person of the Year is Sarah Blake, president of Elipsis Engineering & Consulting (Winter Garden). North Florida District Minority-Owned Small Business Person of the Year Gabriel Ruiz, LTC, USA (Ret. ), president and CEO, Advanced IT Concepts, Inc. (Winter Springs). North Florida and SBA State of Florida Small Business Financial Advocate of the Year is Kristen Tackett, vice president of Business Services of Florida First Capital Finance Corporation (Tallahassee). South Florida District and State of State of Florida Small Business Person of the Year is Sherry L. Acanfora-Ruohomaki, owner/president of K9 Kampus, LLC (Melbourne). South Florida District and State of Florida Minority Owned Small Business Person of the Year is Francisco Semsch, president of Francisco Semsch Architect, Inc. (Tampa). South Florida District and State of Florida Small Business Advocate of the Year is Orlando Espinosa, co-founder of Emineo Media (Miami). South Florida District and State of Florida Small Business Media Advocate of the Year are Pete de la Torre and Sally Villalba of World Business Radio Network, LLC which hosts the Pete Biz Radio Show (Doral). South Florida Small Business Woman-Owned Person of the Year is Tailleen Arias, president of the Doral Conservatory & School of the Arts (Doral). South Florida Small Business Veteran Owned Business of the Year is Brian Butler, Vistra Communications, LLC (Tampa). Region IV Women’s Business Center of Excellence Award went to weVenture (formerly The Women’s Business Center at Florida Institute of Technology) (Melbourne). Ramos assumes the role of Digital Editor / Web Design for FORWARD Florida. She is a graduate of the University of Central Florida with a B.A. in both Digital Media and Art as well as a minor in Creative Writing.